In addition to the wonderful feedback to my post last week about 3 Mistakes You’re Making Online, I also received questions about my third point – using Google Alerts to monitor your reputation online. While I know throngs of hyper-connected people for whom using Google Alerts is second nature, the fact is that this is a new tool for many people. If you’re part of the second group, I strongly encourage you to consider using Google Alerts. There are definitely more comprehensive and sophisticated tools out there, but this is the place to get started tracking what’s said about you online. Best of all – it’s free and incredibly easy to do. Google Alerts is an extremely simple tool to help monitor what is said or shared online about any topic of interest to you. While you are undoubtedly interested in keeping up to date on industry-related topics, local news or your favorite sports teams, one of the most relevant topics to you should be you. This may include information posted online somewhere by you, someone you know, organizations or companies you’re affiliated with or public databases. Surprisingly, there is no mention of monitoring your reputation online, which simply is a must do step for every professional, business, non-profit and anyone who deals with other people who may want, at some point, to learn more about them. Really, who doesn’t this include? Whether you know it or not, and whether or not you like it, everyone is looking you up online. You should assume that your current and potential employers, clients, customers, donors, friends, dates, family members and neighbors are typing your name into Google to find out what you’re up to, how much you paid for your home and to which political candidate you donated money. Sure, if you assume that everyone is googling you, you’ll be wrong in some cases. Still, don’t you want to know what they’ll be finding? You might be surprised to find out how much information is online right now about you. In addition to monitoring your own reputation, it is also a simple way to keep an eye on what is being said about your company, your competitors, the company you hope to work for and so on. Don’t be the last to know! Is it really that easy to set up Google Alerts? In a word – Yes. Google has a simple guide to walk you through the steps, along with some helpful examples. Use quotation marks when you want to get results for a specific phrase, as shown above for my name. 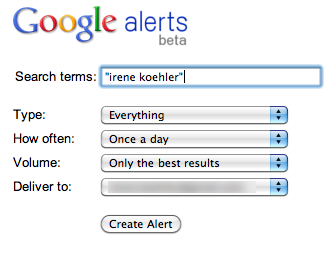 Without the quotation marks, I will receive alerts for every instance online of when the words irene and koehler appear, but not necessarily together as in “irene koehler” and I definitely don’t want to receive emails for all of those thousands of pages which aren’t relevant to me. Set up alerts for any nicknames or usernames you have on different online forums or social networking sites. Your turn…How have you found Google Alerts useful? If you haven’t used them before, do you plan to set them up now? Add a comment below to let me know. It’s so crucial to know how you’re represented on the first page of Google results. Another really good step to take is to generate positive content about yourself that’ll show up high in Google. At Brand-Yourself we help you make sure you own your results (both physically and figuratively), and anyone who Googles you will be impressed! Any ideas for those of us with generic names that are not normally Google-able? Such a great question, Matthew, and one many can relate to. Might be good for a separate blog post. It’s tough to stand out when you’ve got a common name. One idea is to totally rebrand yourself as a version of your name. Many people do this by include a middle name or initial, for example, and then use that everywhere – email address, social networking profiles. Wherever you sign up for anything, use that name. It will take time to build up a searchable presence for the “new” you, but keep at it. You may want to first google whatever version of your name you’re thinking of using to minimize overlap with someone else. YIkes! That’s some rather formidable competition. You’re definitely working against the odds if you’re hoping to rank at the top of search results for your name alone. Still, using the keywords which help lead the right people to you and connecting your online accounts will make it easier to be found.